Downingtown has great range. In just a few miles along Lancaster Avenue, you’ll find Philip Bradley’s legendary antiques shop with museum-quality treasures, Pook & Pook Auctioneers and Appraisers, where a piecrust tea table once sold for $1.4 million, along with Dane Decor’s sleek Scandinavian designs in a converted 19th-century church, complete with steeple and stained glass windows, abutting a modern glass cube of a furniture showroom. The showrooms were the venue for Downingtown’s mayor’s wedding reception, duly covered in The New York Times wedding section. 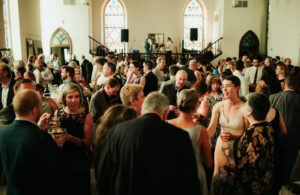 That converted church in this old paper-mill town was the venue for a late summer wedding reception for the young mayor, Josh Maxwell, to Blair Thornburgh, granddaughter of a former Pennsylvania governor and U.S. Attorney General—all duly covered by local press and The New York Times wedding section. When Downingtown first elected a brash 26-year-old mayor in 2009, residents likely had no idea mattresses would someday be moved to make room for a dance floor and wedding reception featuring local beer and a mac-and-cheese bar for 200 in a repurposed church/furniture showroom with sentimental connections to its biggest booster. What might once have been seen primarily as a bedroom community has incubated enough restaurants and breweries to merit consideration as a dining destination. Farmhouse Coffee and Espresso Bar is the spot for a latte. 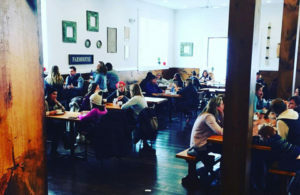 From The Coffee Cup, a timeless spot with three generations serving breakfast and lunch since 1956, to the new-ish Farmhouse Coffee and Espresso Bar, with its exposed beams, lemon scones and latte art, Downingtown embraces its roots along with current trends. For serious dining, visit the mansion outside of town, the Orangery at Glen Isle, serving Tuscan cuisine at one seating three nights a week from a single chef-selected menu. Chef Sabrina Lutz oversees the intimate BYO experience. There’s more upscale dining, seven days a week for lunch and dinner, at Amani’s BYOB, helmed by celebrated chef Jonathan Amann. Here the cuisine focuses not on regional cooking but on the best of our region, with locally sourced, farm-fresh, seasonal dishes. By late summer another destination dining option plans to open in the historic paper mill, former home to Firecreek, Barra Rossa and Milito’s restaurants. Soon Enoteca Tredici, which transformed a warehouse in Bryn Mawr into a hip bar in the ’burbs, will bring its magic and Mediterranean fare to Downingtown. Or go casual and old-school at the Downingtown Diner, family-owned and operated, open seven days a week, 24 hours a day. The classic diner menu includes a nod to their claim to fame—Special Blob Sandwiches—from the diner’s cameo in the 1958 cult classic The Blob. Estrella Tacos y Mas is a new gathering spot. 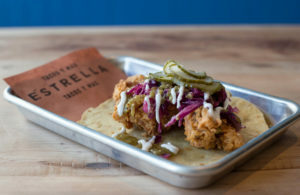 For a newer place with a different vibe, Estrella Tacos y Mas offers “tacos, brisket and love,” at its location on the first floor of a historic stone building—formerly the Minquas Fire Station and later Molly Maguire’s. Try breakfast tacos, all day tacos and yes, “Mas” is actually listed on the menu. This self-described taco truck meets craft beer bar is a growing community hangout. Other food purveyors also demonstrate range. There’s fabled Jimmy Duffy’s Catering, now run by its fourth generation and boasting connections back to the 1920s to F. Scott Fitzgerald, Frank Sinatra and Grace Kelly, plus a Pope and assorted presidents. With a mere 30-year history, Bakers at Buffington have iced decades of wedding and special occasion cakes. And 2018 saw a newcomer transition from farmers markets to a storefront when the Brandywine Valley Bread Company baked up delectables like tomato garlic thyme focaccia. Downingtown offers beer options. Local craft beer pioneer Victory Brewing—started by childhood friends in 1996—expanded beyond its headquarters to a second brewery in Parkesburg and an additional brewpub in Kennett Square. Since 2006, it’s expanded in other ways, partnering with Southern Tier Brewing Co. under parent company Artisan Brewing Ventures (ABV, get the beer joke?). And last year the Downingtown location got a $500,000 renovation providing more seats, better brewery views and a German beer-hall feel. Bottle Room and Station Taproom are beer destinations. For more intimate sipping, head for Station Taproom, across from the SEPTA station and boasting great beer and great food. A wide variety of beers are on rotation, showing the deep knowledge of the owners, along with Chef Tim Smith’s strong menu with faves like mussels, poutine, Thai red curry and fish and chips, attracting fans since 2010. Next door, under the same ownership, is the Bottle Room offering a short, sweet and changing snack menu, heavy on small plates, cheese and charcuterie boards. 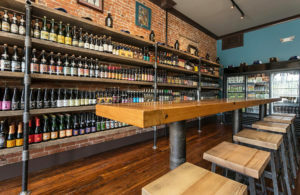 The brick-walled space has a welcoming bar and central community table, plus 16 beers on tap and plenty of, well, bottles. We snagged a bottle of Dressler’s Still Cider (a County Lines Best of the Best winner and another Downingtown star, though with no brick and mortar location). 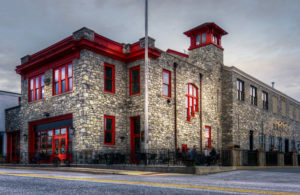 East Brewing Co. found a home in this historic building. For the newest brewery—at least at press time—walk upstairs from Estrella Tacos to East Branch Brewing Co., “crafting beer in the heart of Downington, ten barrels at a time.” That capacity will be expanded, along with the physical space—plans are afoot for a third floor beer garden to open this spring. Childhood friends Kevin McGovern and Dylan Meanix’s long-term partnership resulted in yet another spot to enjoy craft beer and good food from a Southern/Korean inspired menu, where pickle boards meet brisket noodles with, kimchi, sesame noodles, peanuts, scallions and szechuan chili oil. Most fun events in Downingtown happen in Kerr Park, the municipal park off Brandywine Creek. You’ll find everything there from kids’ trout fishing to Earth Day to Good Neighbor Day on July 4th. Urban Air Trampoline and Adventure Park lets kids burn off energy. 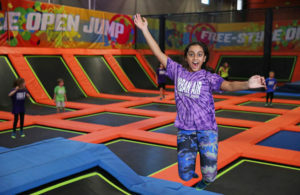 For a different kind of park and fun—indoors and suitable for birthday parties and snow days—head for Urban Air Trampoline and Adventure Park (with a new location opening in Springfield). Kids can burn off steam on the climbing wall, warrior course, tubes playground, and of course, trampolines. Or host a glow party when the lights are off and the lasers, disco, lights and black-lights are on. If it’s artistic energy that needs an outlet, the School of Rock is your destination. Not the Jack Black movie, but here’s a place for music lessons—beginning kids to accomplished adults—in singing, drumming, guitar and more, all options to develop your performing arts talents. Exton has a decidedly different vibe from Downingtown. Known for its malls—Exton Mall and Main Streets—the town is a hub for national chains of all sorts. From the new First Watch—the daytime café—to a Nothing Bundt Cakes—offering fresh-baked bundt cakes, bundtlets and buntinis for every occasion, from baby gender reveals to thanks a bundt cakes. Yet, you’ll also find distinctive locally owned businesses here, too. Some of our long-time favorite independently owned restaurants are in Exton. Family-friendly Ron’s Original Bar & Grille has a menu long enough to satisfy everyone yet filled with plenty of healthy options. Despite being in the Main Streets Mall, non-chain Appetites on Main continues to be a destination for appetizer lovers, sports fans and diners with pets—it’s been a recognized pet-friendly dining spot for years. 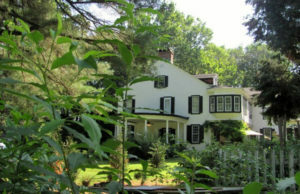 For something more upscale for a special occasion, with table-side prep and flaming desserts, Vickers Restaurant has provided polished service since 1972 in its historic 1820s farmhouse. 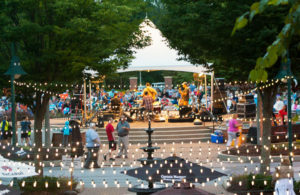 Eagleview Town Center hosts events year round. More distinctive dining options await at Eagleview Town Center, a community within the town of Exton, where you can live, work, shop, play as well as dine. Enjoy Eagleview’s free events—from concerts to farm markets—beautiful park, independent bookstore—Wellington Square Bookshop—and burgeoning Restaurant Row. A bright spot on Restaurant Row is the newest dining option—aptly named Bright Spot Café, serving fresh locally sourced breakfast and lunch with options like skillet dishes and avocado toast. Our Best of the Best awards acknowledged Bluefin Eagleview for its innovative sushi, sushi bar and daily specials, while Suburban Restaurant and Beer Garden got a nod for one of our favorite things—beer gardens! Can’t wait for the right season to enjoy beer outdoors again. Every town in Chester County must have craft beer. Luckily Exton has several choices. Among them is newcomer Stolen Sun Craft Brewing and Coffee Roasting Co., where you should “come for the coffee, stay for the beer.” We suggest sampling the great menu from their carnetaria as well as enjoying the comfy ambiance at this County Lines Best of the Best winner. At World of Beer, the Ripples machine lets you put a photo, design or message in the foam. One final suggestion on this eclectic Exton excursion is World of Beer, previously independently owned, but now part of a Florida-based corporate group. Home to Beerunch—a favorite meal—their l-o-n-g list of bottles and drafts runs from local 2SP Up & Out IPA to Young’s Double Chocolate Stout from England, and beyond. 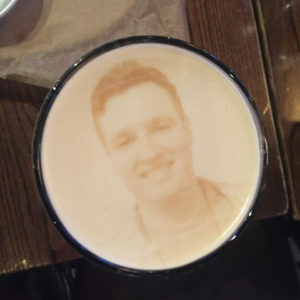 We’re told that as part of corporate, WOB will soon have access to the magic machine that lets you personalize you beer by printing images in the foam with a malt extract. See the photo. We wish we could end with a message on top of a beer. April 13 – BTCC Kids Free Fishing Derby. Sponsored by Brandywine Trout & Conservation Club. Pavilion at Kerr Park in Downingtown. 8 to 2. Free for 15 & under. BrandywineTrout.net/home.html. April 27 – Healthy Kids Day. Hosted by YMCA of Greater Brandywine to improve health and well-being for kids and families. Kerr Park in Downingtown. 11 to 1. YMCAGBW.org. April 28 – Earth Day Celebration. Live music, games, food, vendors and children’s activities. Kerr Park in Downingtown. DowningtownMainStreet.com. June 1–2 – Downingtown Fine Arts Festival. A two-day fine arts festival weekend and community tradition. Sat, 10 to 6; Sun, 10 to 5. Free. DowningtownFineArts.com. May – Memorial Day Parade & Services. Downingtown Veterans’ Memorial in Kerr Park. 10 am. Downingtown.org. June 9 – Crafted—A Curated Arts & Crafts Festival. Demos, craftspeople, food, local wine and craft beer tastings. Eagleview Town Center, Wellington Square, Exton. Crafted-Eagleview.com. June 9 – Chester County Mac & Cheese Cook-off. Local restaurants, businesses and hometown cooks compete. Check website for details. Kerr Park in Downingtown. MacNCheeseCookoff.com. June–August – Movies in the Park. Kerr Park in Downingtown. DowningtownMainStreet.com. June 22 – 5K for Aidan J. Run/Walk for Heart-Safe Communities. Benefits SCA (Sudden Cardiac Arrest) in kids. Kerr Park, Struble Trail. 8 am reg., 5K at 9 am. AidansHeart.org. June 18–22 – St. Joseph Community Festival. Check website for times and fireworks info in Downingtown. StJoesFestival.com. June–August – Downingtown Main St. Assn. Summer Jam Series. Kerr Park. DowningtownMainStreet.com. July 4 – Good Neighbor Day. Run for Life (5K, 10K & 15K) or 5K Freedom Walk. Enjoy food, crafts and other activities in Downingtown. Benefits area emergency providers. GoodNeighborDay.com. September 29 – Downingtown FallFest. Street festival on Green St. & E. Pennsylvania Ave. 11 to 4. DowningtownFallFest.com.